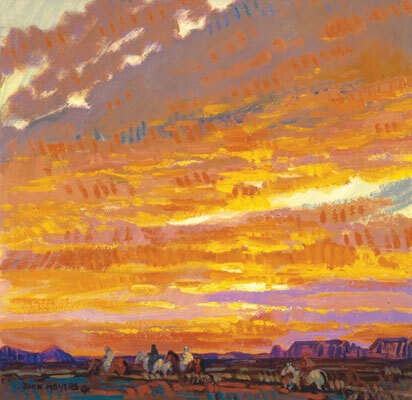 John Moyers, Into the Sunset, Oil, 16" x 16"
Ask any Western Art Collector and they will tell you that artist John Moyers is someone whose work you will want in your collection. 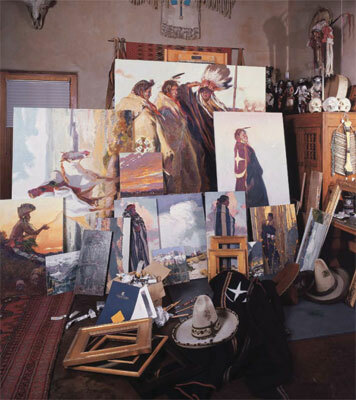 However, President of the Cowboy Artists of America, and son of a well-known artist, Moyers is a very modesy man. And speak with his art he does. His new show will be his biggest ever, with fifty new works. Moyers has been putting together this collection of works for a while. 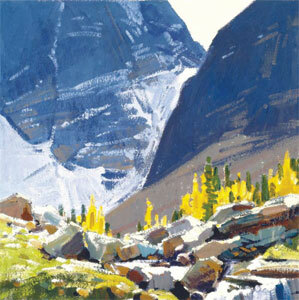 John Moyers, On the Trail to Lake Oesa, Oil, 12" x 12"
The exhibit, according to Moyers, will feature a wide variety of sizes and styles. “This show, I purposely just had fun with it and didn’t set any rules. If I felt like changing directions from one day to the next, I did. There’s a little bit of everything. There’s going to be some watercolors and some oils. There’s going to be some different looks I haven't done before. I'm having fun with it. “I’m always inspired to paint. You might take two or three days off and by the end of the second day you’re ready to paint again. Each piece is unique. I might paint one piece because I saw a really great cloud, or the next painting it might be the low, warm light. The next it might be a silhouette against the sunset. 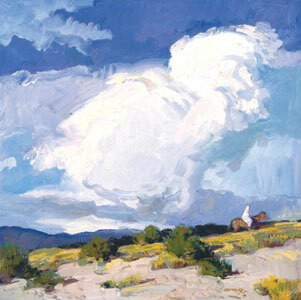 John Moyers, Monsoon Season, oil, 30" x 30"
“We were just over in Canyon de Chelly. I’ve got some of those in the show, some Grand Canyon paintings, some Pueblo Indians, Navajo, several Taos Indians, and a few Mexican Revolution paintings. There are Navajos in Canyon de Chelly, but the landscape is so interesting that I focused on the landscape. I just decided to do some oils focusing on the landscapes because it’s so pretty over there. “The Grand Canyon paintings I did on the spot. I just set up and painted at the South Rim. It was really windy. So I looked for places without many tourists and without wind. It was March, so that was a challenge. “I always strive to try different things. Some times they don’t work and you put those in the closet. We destroy those. You don’t want those to come back to haunt you. Sometimes you can’t figure it out—it’s just not right. Sometimes it’s something you can fix. And sometimes it's beyond repair. “I’m the worst at not wanting to be pigeon-holed. Most people want my Western work with figures in them, but I love painting landscapes, and so I put a few of those in there, too. I always want to paint what I’m excited about painting. That’s what’s always worked for me and I hope it continues to work. “There are no rules. You put them out there and you hope somebody enjoys them. You just never know. Sometimes it’s your best work if it’s something you’re excited about and interested in, you might not think anyone will want it, and then it's your most popular piece. 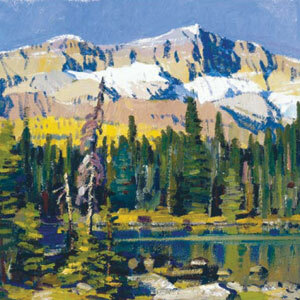 John Moyers, Autumn Lake O'Hara, oil, 12" x 12"
The largest painting in the show features the Black Feet tribe. “My biggest piece is 50” x 60”. It’s a painting of Black Feet Indians, Northern Plains Indians. The late light is hitting the figures. This painting was more about the design than the actual subject matter." 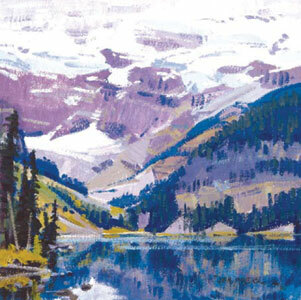 John Moyers, Lake Louise, oil, 12" x 12"
Moyers credits his acceptance in the Cowboy Artists of America as a major turning point in his career. Despite his modesty, Moyers is an artist to be reckoned with. His work continues to gain wide recognition and collectors clamor to own his pieces. This new show, no doubt, will enhance his standing even further.